In a food processor combine the artichokes, parsley, walnuts, lemon zest and juice, garlic, salt, and pepper. Run the machine to finely chop all the ingredients, stopping the machine a few times to scrape down the sides. Then, with the machine running, drizzle in 1/2 cup extra-virgin olive oil. Place a grill pan over medium-high heat or preheat a gas or charcoal grill. Drizzle the ciabatta slices with the 1/4 cup extra-virgin olive oil. Grill until toasted, about 5 minutes. 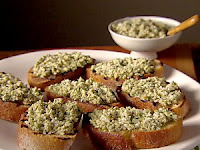 Spread the artichoke pesto over the toasted slices and serve. Is that the one where she has her sister on the show? I just added basil to my grocery list so I could make it this week. Yum! I love Everyday Italian. Interesting variation to the recipe, I’ll have to try it! Oh, hooray for pesto! Delicious. I have very fond memories of the sister in one branch who used to make it fresh and send it home with us nearly every week the entire summer I spent in one city in Sicily. This is from the episode where Giada’s sister just had a baby (so this is a pesto that freezes well). I agree that it would be delightful with cheese. I’ve always made pesto with pineneuts not walnuts–do you know if pinenuts tend to cause allergies in kids?